T-bone was adopted by Ann in early 2015. 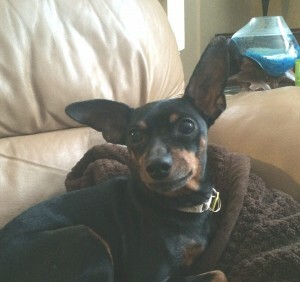 Ann says “T-Bone is very happy in his new forever home with his six family members. He absolutely loves to snuggle and cuddle. He enjoys taking his daily walks with “mum” as his special time of the day and getting treats for his good behaviour. All of us consider ourselves so fortunate to have found him. We love him so much!” What cute ears!! !